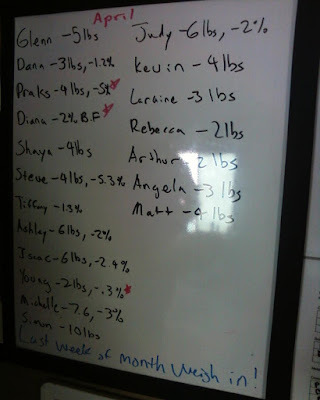 Glenn - 5lbs (5% body fat loss, 6 in. off the waist, and 20lbs total loss). Prax - 4lbs, 1.2% body fat (14lbs total, 3 in. off waist, 10% body fat loss!!! He is now athletic body fat level. His other problem was strength, he went from a 5lb turkish get up to a 25lb get up). Diana - 2% body fat (Officially in athletic body fat with visible abs). Shaya - 4lbs (Officially lean and abs visible when she skips breakfast LOL). Steve - 4lbs, 5.3% body fat (Breakout month. 9.4% total body fat loss). Tiffany - 1.3% body fat (4% total and at the cusp of athletic body fat. Gained 2lbs of muscle which was one of her goals. She is a true success story because she's blind in one eye, had depression, muscle atrophy in her legs, and a partial hysterectomy that got complicated and had to be followed up with several more surgeries. But now strength is her own best cure and she has found her smile and is a 52 year old master of the burpee and box jump). Ashley - 6lbs, 2% body fat (April was her first month). Isaac - 6lbs, 2.4% body fat (Our professional athlete...poker is a professional sport right?). Young - 2lbs (3 in. total off the waist and athletic body fat. One our most athletic clients). Michelle - 7.6lbs, 3% body fat (2nd month 15.5lbs total. 9% body fat loss, 1.5 in. off the waist, 1 in. off hips, arms, shoulders, 2 in. off thighs. Her goal is to inspire. She is already doing that). Simon - 10lbs (April was her first month. She also put a dollar in the whine jar this month). Judy - 6lbs, 2% body fat (April was first month. One of my martial arts clients. She's great at hitting, now if we can get her to block...). Laraine - 3lbs (One of my rehab clients. She has bulging discs in her low back. She travels a lot for work and is now finally able to load and unload the car with her own bags. Before he back would give out whenever she lifted them. Things like this is where you really appreciate progress). Rebecca - 2lbs (Daughter of Tifanny. She's that much closer to looking great for her wedding day. She grew up with asthma which never allowed her to be athletic. She's playing catch up but there's nothing as moving as watching a mother and daughter to kettlebell swings together. Brings a tear to my eye). Arthur - 2lbs (One of my martial arts clients. Now if he can stop accidentally hurting his training partners...). Angela - 3lbs (28lbs total! Shall we see her pass the 30lbs mark in the month of May?). Matt - 4lbs (11lbs totals and one of the training partners Arthur hurts). Congratulations to everybody and all the people waiting in the wings to see their numbers for May!